As day was breaking I arrived at the Reading & District AA car park and was sorting through my worms as Will pulled up. 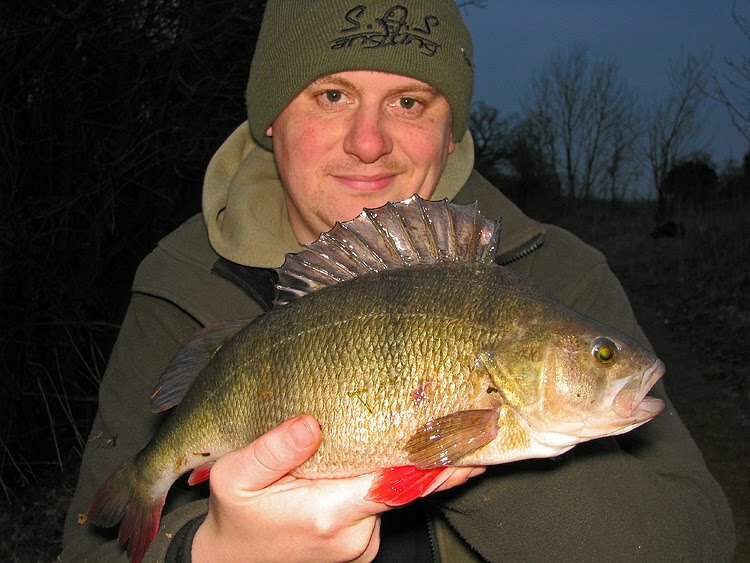 Will not only has a string of massive perch to his name, he is also the angling development officer for Reading, a bailiff and coach for RDAA and is a founding member of a small specimen group based around Reading called SAS Angling! Over the past year, you may have also seen him feature in one or two of Ian Welch's articles in Anglers Mail too... Right from the off I got on really well with Will, who's a genuine, amiable chap, not to mention knowledgeable! My first glimpses of the Kennet gave me instant optimism and I couldn't wait to get set-up. It was slightly couloured and with plenty of perchy features. We set up in a shady area of overhanging near-bank trees, which provided the margins with some shade as the sun rose behind us. The roots were quite terrifying to offer a bait towards, but they were blatant perch (and chub!) holding features. Before long, Will was getting bites which he was suspicious of. Eventually after an aggressive tap on the rod tip, he found the culprit to be a signal crayfish, which apparently plague the Kennet (and many Southern rivers), but the species was completely new to me. Obviously I've read and heard about them, but never actually seen a live one. 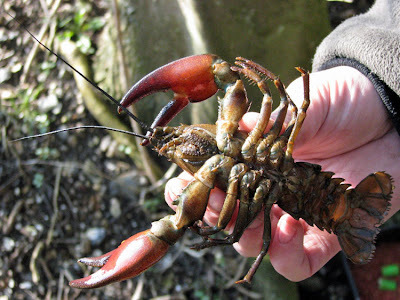 They are aggressive wee beasties with pretty formidable claws loaded with sensory hairs, which allow them to accurately grab at prey in extremely low light levels, while small barbs on the claws help them cling on to their prey once captured. These crayfish are far larger than I expected and besides the fungus they carry (detrimental to our native white-claws), it's easy to see how these creatures have just taken over in so many rivers. The signal was duly despatched and removed from the vicinity of the river, and so were the others which followed. It didn't take too long until I'd caught one myself, which gave me a savage take! Have a look for yourself at these close-ups I took, paying special attention to the size of the cray in comparison to Will's hand! Eventually Will got a bite which was definitely not a crayfish, but within seconds his rig had been pulled into the tangled mass of tree roots and the fish was lost. 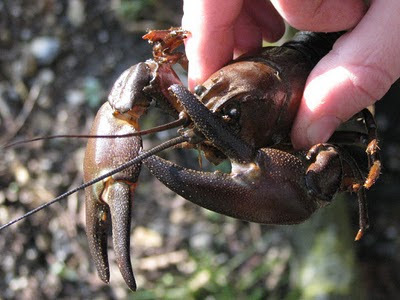 Apart from crayfish, the swims went dead and we decided upon a move onto the nearby Kennet & Avon canal, to pass the early afternoon before returning to these tree-lined swims later on. It was quite a hike with all the tackle, but after about 20 minutes walking we ended up at a "Perch paradise"! This place was straight out of the textbook; if someone sketched an example swim with features to look for, this place would have more features! On the near-bank there was a mixture of overhanging bushes, trees & brambles and moorings; on the far bank there were these, plus a resident barge; downstream the water shallowed and upstream a small stream flowed in. 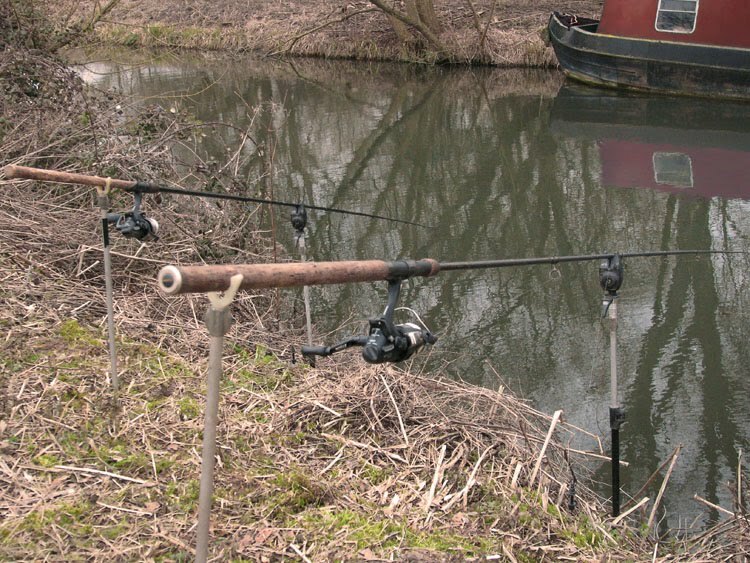 The banks were high and steep and the water was really clear, so we set up well-back from the water and crept up to our pegs to cast. After the slow morning (and previous day! ), seeing this place was an inspiration and I began to get quite excited at the prospect of what perch lurked within this stretch. Will also said he had a good feeling about the place, so we decided to stay put for the rest of the day and see what happened. Will had a bush in front of him, growing well out into the water and sheltering around this were thousands of minute, freshly hatched fry. Something had been spawning recently, but we couldn't tell exactly what species they were. Could they possibly be perch fry, meaning any perch we caught would be a fair bit leaner and lighter? 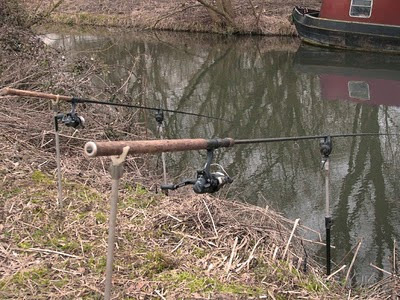 I was first to get a bite here, as the bobbin on my right-hand rod jerked and lifted a few times promisingly. On this rod I'd cast an air-injected lobworm fished in conjunction with a maggot feeder, under the barge on the far bank. The bite never progressed into a proper run, so I twitched the bait back a few inches towards me. A few minutes later the same bait was taken again, but I failed to connect with the culprit. We managed to catch a single gudgeon, which we hoped would be enough to tempt one of the large fish - which was no doubt lurking beneath the barge - out of its lair for an easy meal. It wasn't to be though, and as it happened we probably caught this gudgeon half an hour too early. As the light began to disappear, the perch finally came out to play, but by this time the gudgeon had seen better days. Five or six sprays of fry from all around our swims signalled that the perch were actively chasing the fry we'd spotted earlier. They had been there all along! How big perch manage to keep a check on there natural urges for hours until the time is just right (it had been overcast for most of the afternoon, yet still they waited for dusk! ), I'll never know. All of a sudden our worms started attracting attention. First, Will hooked into his first positive bite from the peg and landed a fish of just below a pound. We knew there were larger ones lurking and Will's next bite turned up a completely different beast. This one was fighting hard, trying its best to snag Will's line on one of the many snags/sanctuaries (depending on the angler/fish viewpoint!). Luckily we both had extending landing net handles and I managed to coax this fat, round perch off the overhanging grass it had snagged in, and into the net. There was still enough time for me to have what seemed to be a promising run on the near-margin rod, but it turned out to be very violent but too quick for me to strike. I stood poised, waiting for it to go again, but unfortunately it didn't. We fished on slightly into dark, but I managed to end the second river season in a row with a blank session! Will is soon to be offering guided perch trips on the Kennet and K & A canal, which I'd recommend if you want to be in with a chance of latching into a real beast of a stripey. With his vast knowledge of this species in particular, you're bound to learn some key tactics to help you in the future too. When his guiding is in operation, I'll post more details on here but meanwhile if you'd like to arrange a day fishing with Will, email me and I'll put him in touch with you.